Physio-Control Surface-Mount AED Cabinet with Strobe Light and Audible Alarm. 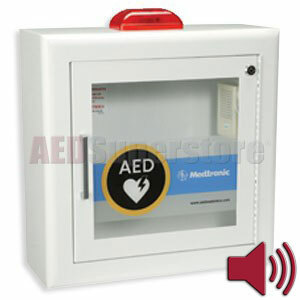 The sturdy metal construction protects and prominently displays your AED. Door-activated flashing strobe light and audible alarm alerts everyone the AED has been deployed for rescue. Compatible with LIFEPAK 500, LIFEPAK 1000, LIFEPAK CR Plus and LIFEPAK EXPRESS Defibrillators. The window is constructed of Lexan polycarbonate.